Watch a webinar on “Preparing Your Students for the AP* Exams” with AP* Krugman supplement author Dave Mayer. Please allow 30-45 minutes for the 1:20 minute video to load. Also view Dave’s PowerPoint slides. Listen as co-author Margaret Ray discusses using Krugman’s Economics for AP* to teach AP Economics. Watch instructor video reviews here. 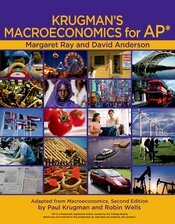 Krugman’s Macroeconomics for AP* combines the successful storytelling, vivid examples, and clear explanations of Paul Krugman and Robin Wells with the AP* expertise of Margaret Ray and David Anderson. In this exciting new AP text, Ray and Anderson successfully marry Krugman’s engaging approach and captivating writing with content based on The College Board’s AP Economics Course outline, all while focusing on the specific needs and interests of high school teachers and students. As an added bonus, a special high school (hardcover) printing of co-author David Anderson’s Economics By Example is bundled with the textbook absolutely free. Throughout the text and instructors materials, teachers will find suggestions for how to integrate chapters from Economics by Example into their course.